I want to tell you about a tune and how it has evolved. Most American men above the age of fifty who grew up watching John Wayne movies are familiar with this melody without knowing its name, let alone its history. Here it is. Recognize it? The tune is called “Garryowen,” and it has been featured as a military marching song in several movies, including The Fighting 69th, They Died with their Boots On, Fort Apache, She Wore a Yellow Ribbon, The Long Gray Line, Little Big Man, Son of the Morning Star, Gangs of New York, Rough Riders and We Were Soldiers Once… And Young. But it is much older than Hollywood, and it has a fascinating history. The Irish word garryowen combines the proper name Eóghan (“born of the yew tree”) and the word for garden garrai – thus “Eóghan’s Garden.” The term refers to the area of Garryowen (first described in the 13th century) near the city of Limerick. This drinking song – it calls upon Dionysus, or Bacchus – was very popular among British soldiers who, along with these Protestant Irish, were engaged in the centuries-long suppression of Catholic Ireland. The Catholics lost their land and became dirt-poor. Because of their impoverished condition, many generations of their young men had little choice but to join the army and become mercenaries for the very empire that had conquered them. They sang Garryowen in the Napoleonic Wars and the Crimean War. Later, the tune became associated with a number of British military units, as well as theIrish Regiment of Canada. But this is an American story, about how we frame the stories that we tell ourselves about ourselves. The Protestant Scots-Irish were one of the largest ethnic groups to settle the American South during the 17th and 18th centuries, some as freemen and thousands of others as indentured servants. Some prospered in the atmosphere of white privilege that they encountered, and they participated in the western migration over the mountains. In the 19th century they formed the backbone of the Confederate army. The Catholic Irish began to come to America in the 1840’s, as refugees from the Great Famine. The failed revolution of 1848 forced many more of them to emigrate, mostly to the large northern cities, where many joined the U.S. army. Some of them deserted during the Mexican war, formed the “St. Patrick’s Battalion” and fought on the Mexican side. Later, others formed the first Irish-American regiment, New York’s 69th, the “Fighting Irish,” made famous by the James Cagney film, The Fighting 69th. And they brought Garryowen with them as their marching tune. Once again, as in Ireland (and as in the next century), the Irish found themselves on opposite sides in the Civil War, which was in large part fought between Irish Protestants and Irish Catholics. Many of the Northerners marched to Garryowen. Both sides sang When Johnny Comes Marching Home, a rewrite of the much older and darker Irish lament Johnny I Hardly Knew Ye. Garryowen began to achieve its mythic status when Irish Civil War veterans joined George Custer’s Seventh Cavalry and brought their song along with them. It was the last tune played by the Regimental band as they rode out towards the Little Big Horn and “Custer’s Last Stand,” an iconic moment in American myth. Later, Hollywood connected the tune with John Wayne and made it recognizable to millions by including versions of it in every movie it made about Custer. 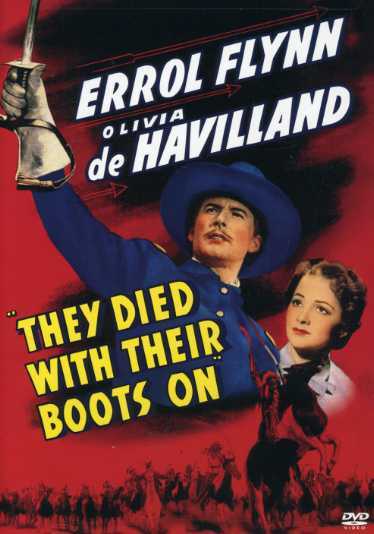 Here, in They Died With Their Boots On, with Errol Flynn in the lead role, is Hollywood’s version of how it was adopted as the quintessential Cavalry soundtrack. Watch the whole three-minute clip to get a full sense of its mythmaking power. The regiment achieved its revenge for the Little Big Horn defeat when it massacred 300 Lakotas at Wounded Knee in 1890. It went on to serve in all the wars of the 20th century, and to this day the name “Garryowen” is part of the regimental crest. The Seventh Cavalry traded in its horses for helicopters when the U.S. invaded Viet Nam War and became the “Air Cavalry” that was depicted in Apocalypse Now. And despite that film’s usage of Wagner’s Ride of the Valkyries, the regiment (and several others) has retained Garryowen as its official tune. By the end of the 20th century Garryowen had become synonymous with patriotic service in the armed forces, and the name was being used in many contexts. 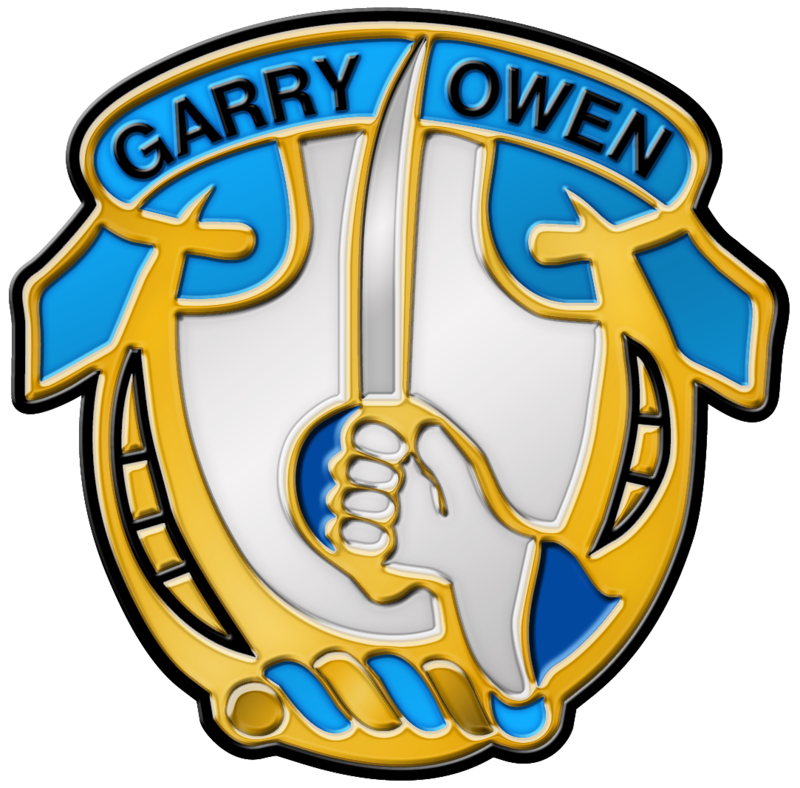 There is a Camp Garry Owen in South Korea, and there was a base Garryowen during the invasion of Iraq. Indeed, the fact that the “Air Cav” has used Garryowen as the soundtrack for a recruitment video is evidence of how familiar it is to young men in this country. Members of the regiment shout “Garryowen!” to each other, in the same way that Marines shout “Hoo-rah!” It is now the soundtrack for a nation of macho men who have dedicated themselves to killing the Others of the world, to maintain a mythology of exceptionalism and innocence. The culture of death has an appetite for images, even those images that true artists create. Ronald Reagan co-opted Bruce Springsteen’s Born in the USA; beer and car companies sponsor tours by musicians; loudspeakers play We will rock you as the bombers take off; CIA torturers blast Heavy Metal into prisons to disorient prisoners; and Jimmie Hendrix’s Voodoo Child is played at boot-camp initiations. Skinheads sell racist rock over the Internet, while misogyny drives much Hip Hop. The volume increases as civic involvement declines. Our myths, including the myth of American Innocence, are conveyed through images. It is easy enough to understand the effect of graphic images – pictures, film, TV and digital – but sound images also contribute to the regular socialization of the young and the internalization of group norms. Some researchers call this process entrainment, and music is integral to its effect. To feel the impact of Garryowen, simply re-play any of the music video links in this essay and imagine yourself marching to it, along with hundreds of young men desperate for initiation. Or, in its 19th century context, image yourself astride a stallion, prancing along to the regimental band with Errol Flynn. Or: imagine the tune slowed way down in tempo, as we will consider it in Part Two.